Business organizations have a structural hierarchy that defines the relationship between individuals involved in the organizations. The hierarchy structure in an organization is in the form of a pyramid. A president or a Chief Executive Office is at the top of the structural pyramid while interns and new employees are at the base level. The hierarchy structure defines the channels of communication and working. Direct Selling companies also have a hierarchy that determines the relation between the direct sellers enrolled with the company. The hierarchy model is known as the Marketing Organization. Strategy India, a consultancy specializing in the sphere of direct selling, defines – "Marketing organization" is the way of representing the tiered nature of the direct sellers in a graphical form to help them recognize their relative positions to the company or direct sellers above or below them. Marketing Organization is commonly known as the Tree Structure or Network Structure. 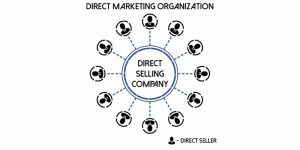 Unlike the fixed and proportional hierarchy structure of a business, the size of the marketing organization of a direct selling company continues to grow as new prospects are enrolled in the business by direct sellers. A direct seller who enrolled with a company earlier is going to be at a higher position in the structure than a direct seller who enrolled afterward. Why is Marketing Organization Needed? A direct selling company needs to keep track of its direct sellers and their performance. The graphically represented marketing organization helps the company understand its growth in different sectors. Traditional businesses make use of sales outlets to keep track of their profits. Every direct seller enrolled with a direct selling company acts as a sales point. The company can gauge the performance of its direct sellers using the marketing organization and provide necessary training and support to improve their performance. Marketing Organization defines the positions of direct sellers with respect to each other. All direct sellers who have been enrolled by a particular direct seller will be a part of the enroller’s subtree. It helps a direct seller understand the hierarchy of the organization and their relationship with other direct sellers. They can find and trace all direct sellers in their market organization and assist them in developing their business. The compensation plan and the remuneration offered by the direct selling company depends on the structure of the marketing organization. Multi-level market organizations pay direct sellers commissions based on the sales made by them and the direct sellers under their market organizations. Hence, understanding Marketing Organization is crucial for direct sellers to build their business and succeed. 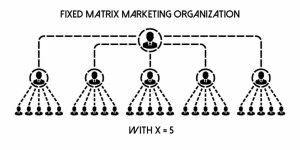 There are different types of marketing organization structures such asuni-level, generation, breakaway, matrix, binary, pyramid, and stair step break away. 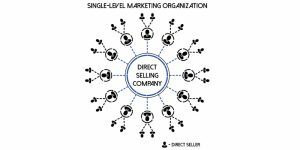 The marketing organization structure of one direct selling company may be distinct from that used by others. The direct selling industry “experts”, common people and the government agencies get confused with terminologies related to marketing organizations. Strategy India has defined and classified marketing organizations to help people understand different types of marketing organizations easily. The fundamental characteristics of each marketing organization structure have been laid down in a clear and simple fashion with proper classification. The marketing organization structure is in tree form with nodes and branches. The node is used to represent a direct seller. A prospect enrolled by a direct seller is placed in a branch under his tree which is also called marketing organization. The frontline structure of the marketing organization defines the number of branches in a tree. A binary frontline has two branches under a direct seller. 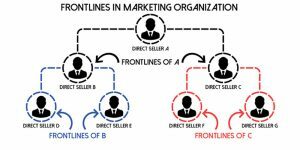 A trinary frontline structure has three branches under every direct seller. Simply put, a frontline is the number of direct sellers directly linked to their enroller. The generation structure of the marketing organizations defines the number of horizontal levels in it. A structure may have a single horizontal level or multiple ones.It determines how many times the frontline structure is repeated in the marketing organization. Simply speaking, it is the maximum number of direct sellers that can exist in a single branch or leg of the direct seller’s marketing organization. A binary frontline structure consists of two legs or branches. A direct seller can enroll two prospects who are directly linked to them. Graphically, every node has two sub-branches popularly called a left marketing organization and a right marketing organization. Every subsequent direct seller also has two organizations, a left one, and a right one. A direct seller can enroll two direct sellersin their frontline. Any subsequent enrollment will have to be placed in the frontline of another direct seller. 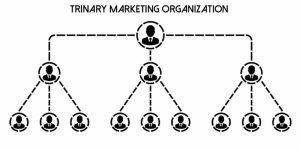 A trinary frontline structure is just like a binary structure but has an additional marketing organization. There are three frontline direct sellers at each level. Besides the left and right organizations, a middle organization is also present. A fixed matrix type frontline structure has a predefined number of frontline direct sellers. The number may be four, five or X. The ‘X’ will depend on the compensation plan of the direct selling organization. A few direct selling companies that employ fixed matrix may pay compensation to a direct seller even if only some of their marketing organizations are active. 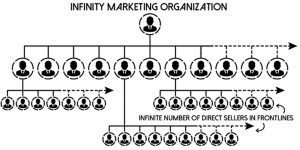 A few direct selling companies employ the infinity marketing organizations structure. It allows an infinite number of frontline direct sellers linked directly to a single direct seller. In such a structure, the number of generations or horizontal levels might be limited to one or a few. It is also known as sunflower marketing organization. A direct seller may earn commission from the sales of his or her frontlines. A generation in a marketing organization defines the interlinkingof the direct seller and the company. The depth of a frontline structure will also depend on the number of generations. 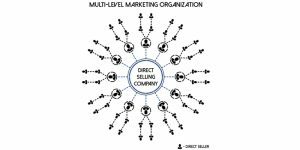 A company may choose to have the direct sellers structured in a Direct, Single level or a Multi-level marketing organization. In a direct structure, every direct seller enrolled with the company is connected directly to the company. The compensation paid to the direct sellers depends on the products they have sold. The percentage commission offered by the company increase with an increase in sales volume. A direct seller will have no benefit from sales of other direct sellers. In a single plan, every direct seller that is recruited by the company or its employeeis allowed to enroll other direct sellers. Every direct seller has one generation ofdirect sellers under them. Direct sellers are paid compensation for the sales made by them and the direct sellers they have enrolled. A multi-level marketing organization allows all direct sellers to recruit more direct sellers. Such a marketing organization has multiple generations or levels in its structure. Direct sellers may be paid compensation based on the sales that have been made by them and the direct sellers under their market organization structure. 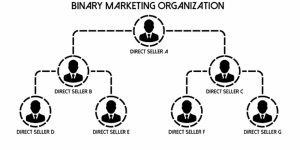 All direct sellers must be aware of their own marketing organization structure. It will give them a clear understanding of their sales potential and their demographics and will help them plan their work to ensure maximum benefits from sales.